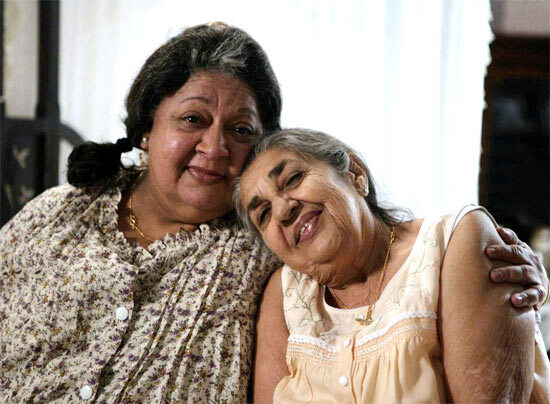 Shammi, the well known character actress, passed into the ages, March 6. Rediff.com's Patcy N remembers her conversation with the charmer. 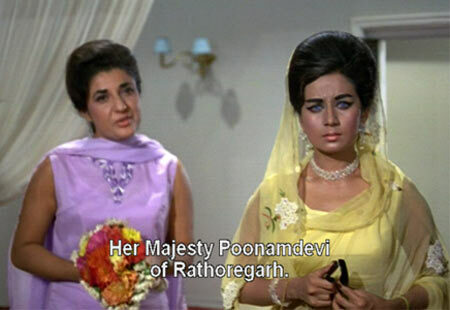 We have seen actress Shammi in scores of movies -- Coolie No 1, Khuda Gawah, Hum, Arth, The Burning Train to name but a few, the recent Shirin Farhad Ki Toh Nikal Padi as well as the television series Dekh Bhai Dekh. 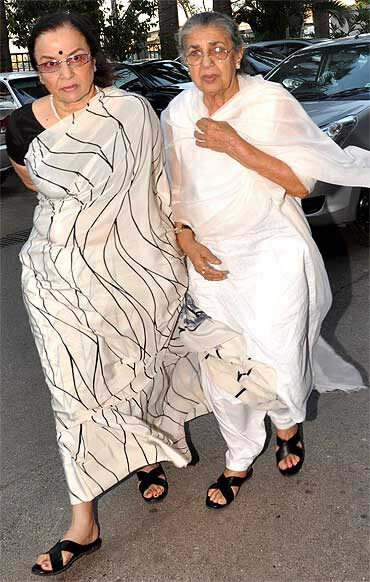 The octogenarian actress does not like to sit idle, and wants to work even today. 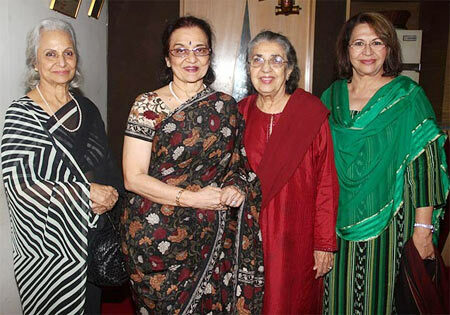 When she's not working, she meets up with her friends Asha Parekh, Waheeda Rehman, Helen and Nanda (this interview was conducted on 2013 when Nanda was still alive). The cheerful Shammi has seen many ups and downs in her life. Her father passed away when she was three, and her marriage broke down after seven years. She produced a film that flopped and incurred losses, but she braved it out. When I arrived at her home, Shammi apologised profusely. She had forgotten all about our appointment, and was about to leave. The second time I met her, Shammi was a charming and delightful host, and spent hours chatting about her life. I have lived in Mumbai all my life. My real name is Nargis Rabadi. I had an elder sister, Nina Rabadi, who was a fashion designer. My father was a priest at an agyari (Parsi fire temple). He died when I was around three years old. My mother looked after us. She used to cook at all religious functions; among Parsis it is compulsory for the priest's sister or wife to cook the food. My mother's younger sister lived with us. When we were kids, we stayed in Tata Blocks (cheap housing provided by the Tatas) in Parel (central Mumbai). In the sixth standard, my sister and I went to a school where the fee was Rs 11. The Tatas had a wooden toy factory in the colony and my sister and I asked for jobs there. They couldn't give us a job, but they told us to work there for two to three hours after school and in return, they would pay our school fees. My sister joined Johnson and Johnson as a secretary after she finished school. I too worked there after my matriculation. I was in the packing department. My job was to collect the tablets that had fallen from the machine and put them into big bottles. Then those tablets would go to hospitals for free distribution to patients. I was paid Rs 100 per month. I got into films by chance. A family friend we called Chinnu Mama was working with Mehboobsaab (Khan, the legendary film-maker). He was very friendly with Sheikh Mukhtar (actor and producer), who was starting a new film with Begum Para. He wanted an actress for the second lead. Mama asked me if I wanted to work in films and I agreed. I had to go to the studio the next day as they wanted to check if I could speak Hindi or not. I immediately replied, 'But I am talking to you in Hindi so you find out whether I am talking properly or not.' Sheikh Mukhtar was quite shocked. Chinnu Mama told me: 'Stupid, he is the boss'. Sheikh Mukhtar liked my spirit and I got the job. The next day I went to Mahalaxmi Studio for the shooting. 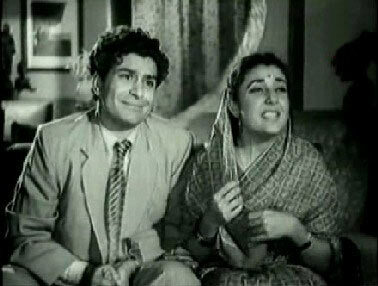 Mehboobsaab's actor from Aurat, Harish, was directing the film. My name would have to be changed, he said, since there is already a Nargis in the industry. So my name was changed to Shammi. My monthly salary was Rs 500. I had a three year contract and I couldn't work outside without their permission. I was just 18 when I signed my first film, Ustad Pedro, in 1949. I have spent 64 years in the industry. After I signed up, I had to go to the studio every day and practice acting even when I had no shoot. I had to read dialogues of other films. Harish taught me a lot of things since he was an actor himself. If you want to be a better actor, he said, you should know how to cry on your own without using glycerine. Harish was directing another film for (singer) Mukesh, Malhar. I was given the main lead in that film. I was too raw, my work wasn't good, but for Malhar I got good reviews. Malhar's music was a super-hit. After my first few films I told my mother let's move out of the Tata building as some other deserving candidate should get it. I was earning good enough, so we shifted to Bandra. During the shooting of Malhar, I met Nargis and we became good friends. Her mother Jaddanbai was strict; everybody was frightened of her. One day she came on the sets and she told me, 'Yeh sab badmaash log hai, tum bahut achchi ho, sambhal ke rehna (These are all rascals, but you are very nice. Take care). Nargis would frequently call me to her house in Marine Drive. She was my best friend. We were like soul mates. We would sit and chat for hours. She could guess what I was thinking -- that's how close we were. Nargis was the first actor to be paid Rs 1 lakh; even Dilip Kumar did not get that kind of money then. It was the talk of the industry. Actors like me who did supporting roles would get around Rs 10,000 to Rs 15,000. I made lots of friends; I was friendly with Dilip Kumar too. 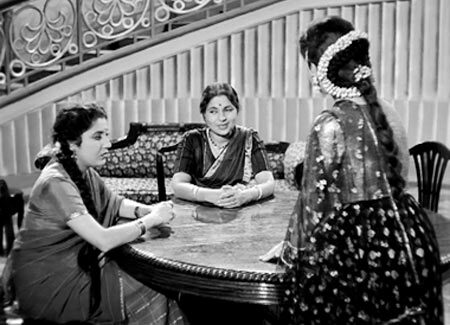 My third film was with Dilip Kumar and Madhubala, Sangdil. He was a top star, and I was still getting to know the industry. Everybody was in awe of him. Every time Dilip Kumar entered the sets, everybody would be quiet and speak in low voices. After that we became very friendly. I would tease him. Everybody would tell me you harass him so much, he may get angry with you some day. But he never got angry with me. He would say his dialogues very softly. Sometimes I could not hear what he said and I would have to go very close to him to hear what he was saying. When he was giving his close-up shots I would stand behind the camera and laugh and he wasn't able to concentrate. So when I had an important emotional scene, he would stand behind the camera and make faces. We are good friends even today. I still go and meet him and he still scolds me. Sangdil failed and I did not get work for seven months. I used to play the main lead or second lead, but now I started taking whatever work came to me. I even took a few films with vamp roles. Many people scolded me when I did that, but I was clear in my mind that I had to work. Sitting at home would not help me since I was the breadwinner of the family. Today I think I survived in the industry because of my ignorance. I did whatever role came to me and did not wait for big roles. I got work regularly and I kept working till the time I made one mistake in life -- I got married. I got married very late in life, in my 30s, but it didn't work out. I married Sultan Ahmed. When I married him, he was nothing. Later, he directed movies. I had lots of friends in the industry and because of me, he got an entry into the film industry. Everybody worked with him without asking too many questions as he was my husband. 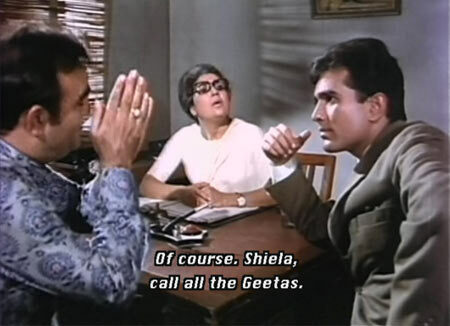 In his first film (Heera), Duttsaab (Sunil Dutt) was the hero and Asha (Asha Parekh) was the heroine. In his second film, Ganga Ki Saugand, Amitabh (Bachchan) was the hero. After I married him, everybody thought I would never work again. I got less work. I also made a mistake and did not take acting offers that came just after my marriage. We did not have any children. I was married to him for seven years. We bought a house. My husband wanted to put it in my name, but I said his sister was not doing anything, put it in her name so she will have some security. I was working then, so did not think about it. My husband, his brother and his wife and child lived with us. His brother's wife was uneducated, so I took care of the child. I admitted him to a school in Shimla. After he finished his education he stayed with me even after I separated from his uncle. One day I just walked out of the house -- another stupid act of my life. I didn't have any cash in hand. I left my car too. I had the old house where I stayed with my mother, so I shifted there. Nargis was so upset, she gave me a long lecture. Where do you think you are going to get money from, she asked me. Within eight days I got an offer to work in a film with Hema Malini and Dharmendra. Now he (Sultan Ahmed) is no more, so I don't want to say why I walked out of the marriage. I was too independent and would not take any nonsense from anyone. He spoke in so many articles about the whole thing between us, but I kept quiet. Everyone who knew me knew how I was, so it did not matter much. I became good friends with Asha (Parekh), who is 16 years younger than me. I was a good friend of her mother's. When her mother's health was not good, Asha would ask me to go with her if she had to meet anybody and even on shoots. If we were working on the same film we would go to the shoot together, that's how we became closer. When her mother was very sick, she told me that her daughter was not married. She is all alone, who will take care of her after my death. I told her I will be with her till the time I am alive. After her mother died, her aunt took care of her. Since she passed away, Asha is all alone and vulnerable. She has never been alone in her life. Somebody always looked after her all her life. She is child-like. She has not seen the world and she is still learning. I meet Asha every day. We get along very well. I am older than her, but she scolds me all the time because I do stupid things. 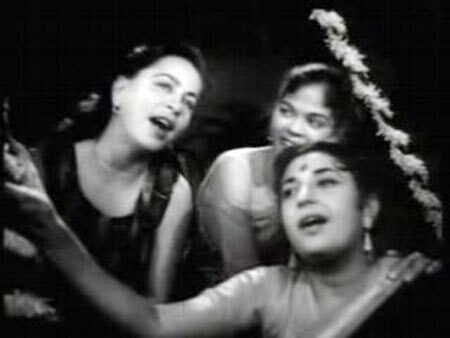 I am good friends with Waheedaji (Waheeda Rehman) and Nanda. I have done a few films with Nanda and we became good friends on outdoor shoots. Nanda is also unmarried. She was engaged to marry Manmohan (Manmohan Desai), but he passed away. It has been so many years since his death, but she till wears white. I am good friends with Helenji as well as Salmaji (Salma Khan, Salman Khan's mother). I produced a film, Pighalta Aasman. Rajesh Khanna was going to act in the film and he suggested a director (Esmayeel Shroff) who came on board. Then something happened between the two. 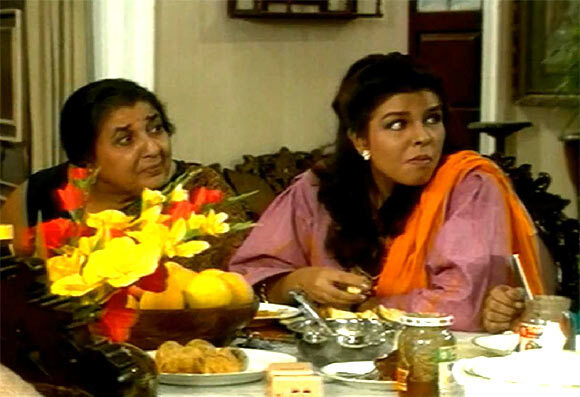 They had a fight at dinner and Rajesh Khanna walked out of the film. It had still not gone on the floors then. Because Rajesh Khanna was acting, I had brought in a big actress, Raakhee. So now I had a big actress, but no hero. The distributors were after me as I had promised them Rajesh Khanna. I approached Shashi Kapoor and told him everything. Shashi Kapoor was very kind. He just said, 'Aapki picture hai toh main zaroor karoonga (It is your picture, so I will do it)'. He did not even ask me how much I was going to pay him. Everything fell in place. But the director sucked the life out of me. He fought with everyone on the sets. Ultimately, he was thrown out of the film before the dubbing was completed. On outdoor shoots, he . He would ask me to get him tea. Shashi would get very angry, but he would keep quiet because of me. The film bombed at the box office. I knew it would flop. I went into a big loss. To help me recoup the losses, Rajesh Khanna, who was producing television series then, helped me get a few shows to produce on Doordarshan. In television, work never ends. Film shooting ends within a year. So I prefer working in films. But when I did television, film people thought now I will only work in television so movie offers stopped. And if an offer came, it wouldn't be good enough for me to leave a serial and do it. I was getting paid well and I saved money. I have always lived a very simple life. From my very first movie I never went asking for work -- the work came to me. But in between I had no work and I was sitting at home. Then, recently, I was offered Shirin Farhad Ki Nikal Padi. Bela (Sehgal, director) wanted me to do it because it was the role of a Parsi woman. I said yes, but I didn't get the pay that I should have got. Still, I enjoyed doing the film because I got to work with Boman (Irani). We laughed a lot and had a gala time. This feature was first published on Rediff.com in February 2013.